Saraca thaipingensis is medium sized, evergreen tree with a wide-spreading crown, which grows to a height of 7 m or more. Leaves are simple pinnate, large, with up to 8 pairs of opposite, 20-40 x 6-12 cm leaflets but without a terminal one. Young leaves are cream-coloured, hanging limply in tassels for a few days before they stiffen and turn green. Flowers are 1-2 cm across, faintly fragrant, in dense bunches that arise from the trunk and main branches, making for an unusual and spectacular display. They are light pinkish yellow turning deep yellow with a dark crimson eye spot which darkens to blood-red. Most of the flowers in a cluster are functionally male, the others bisexual. Pods are large, 30-45 x 6-10 cm, thin, flat and leathery. They turn purple with maturity, splitting into two coiled halves to expose the flat, black seeds. This is an attractive flowering tree for parks and gardens. When in bloom, the tree attracts masses of nectar feeding sunbirds like Purple-throated (Nectariniua sperata), Crimson (Aethopyga siparaja), Olive-backed (Cinnyris jugularis) and Brown-throated (Anthreptes malacensis) as well as the Asian Brown Flycatcher (Muscicapa dauurica). 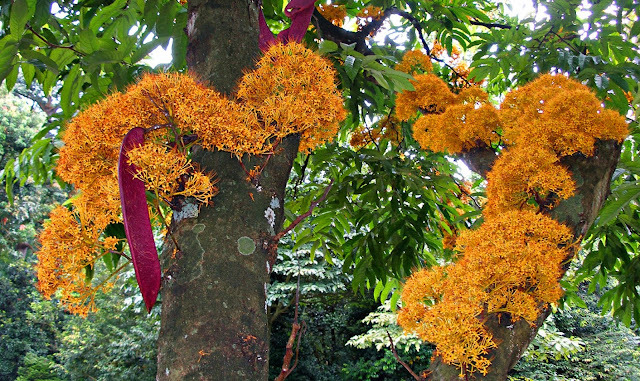 The tree is native to Peninsular Malaysia, but is cultivated in a number of tropical countries. The specimen here was photographed in the Singapore Botanic Gardens. This plant is beautiful and I have never seen it here in Germany! I've never seen one of those. Interesting.